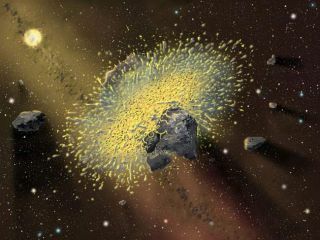 Artist's conception of a possible collision around BD +20 307 that might have created some of the dust observed in the recent Gemini/ Keck observations. The collisions responsible for the dust could range in size from asteroids (approximated here) to planets the size of the Earth or Mars. A young and relatively nearby star has an environment that looks a lot like home, with collisions between planet-sized objects that resemble the early days of our solar system, astronomers said last week. The star, catalogued as BD +20 307, sits just 300 light-years away. It is slightly larger than our Sun. No planets or asteroids have been directly observed. But astronomers are mining facts by studying dust, and this is the dustiest star of its age in our corner of the galaxy, suggesting a recent event that fits neatly with theories of what happened in our young solar system. Dust envelopes are common around newborn stars and are the ingredients of planet formation. But BD +20 307 isn't a newborn. It's about 300 million years old. Any planets should have formed, according to the leading theory, and so the dust should have been mostly scooped up. But scientists have known for years that BD +20 307 is surrounded by a significant amount of smoke-sized particles. New observations from the Gemini and Keck observatories in Hawaii pin down the quantity of dust, its temperature, and also reveal that the envelope sits at the same distance from the star as Earth is from our Sun. "The dust we detected is exactly what we would expect from collisions of rocky asteroids or even planet-sized objects, and to find this dust so close to a star like our Sun bumps the significance way up," said astronomer Inseok Song at the Gemini Observatory. Astronomers think that Earth's Moon was created when our planet was hit by a Mars-sized object shortly after the solar system formed 4.5 billion years ago. A lot of dust was kicked up in the glancing blow, while some of the material coalesced into a new satellite around Earth, while our planet remained largely intact. Song and colleagues see an interesting possible similarity in their new data. "The amount of warm dust near BD+20 307 is so unprecedented I wouldn't be surprised if it was the result of a massive collision between planet-size objects, for example, a collision like the one which many scientists believe formed Earth's Moon," said team member Benjamin Zuckerman, a professor of physics and astronomy at UCLA. At least, the researchers say, two asteroids with minimum diameters of 185 miles (300 kilometers) smashed together. "Whatever massive collision occurred, it managed to totally pulverize a lot of rock," said Alycia Weinberger, another researcher in the group, from the Carnegie Institution of Washington. The event occurred within the last 1,000 years or so, the scientists say, because had more time gone by the dust would have been lured into the star. Some dust remain in our own solar system even today, but it is a small fraction of what's been observed around BD+20 307. The leftover dust here creates the eerie Zodiacal Light, seen only in perfect conditions a few hours before sunrise and after evening twilight. Sunlight is reflected off the dust in space, generating a glow that can fool a predawn observer into thinking the Sun is coming up. "The amount of dust around this star is approximately one million time greater than the dust around the Sun," said UCLA researcher Eric Becklin. The results were detailed in the July 21 issue of the journal Nature.